Low odor vegetable, ornamental, Rose, flower, fruit, pet and livestock insecticide. Provides both repelling and killing action of over 60 insects. May be applied until one day before harvest on listed vegetables. Controls Colorado Potato Beetles and listed Loppers, Beetles and Borers on listed plants. 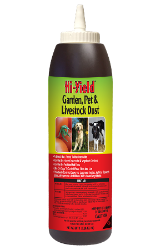 Controls horn flies, lice and face flies on beef and dairy cattle and horses. Controls feas, ticks and lice on dogs.